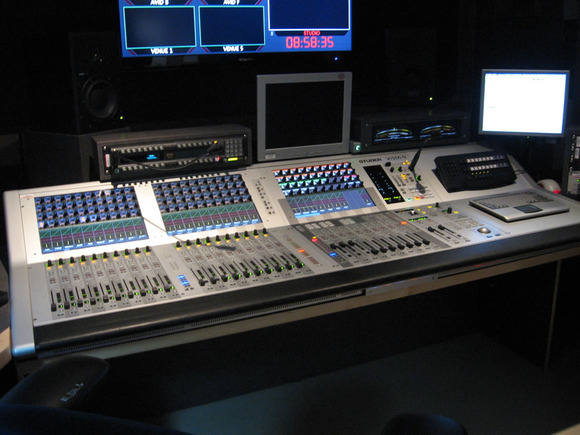 MONCTON, Canada – In the first use of a Studer Vista 5 console in a CBC/Radio-Canada facility, Radio-Canada Acadie with main studios located in Moncton, New Brunswick recently purchased a Vista 5 for its television studio. Sold through Solotech Inc., the Vista 5 console features 32 faders in a 42-fader chassis. Radio-Canada Acadie’s audio technician Roger Thériault along with team members Ghislain Jean; project leader from CBC/Radio-Canada Broadcast Engineering in Montreal and Gilles Bourgeois; maintenance technician and project coordinator in Moncton—researched a variety of audio consoles for the facility. “We chose the Vista 5 because it was the audio console that best met our present and future program needs. This model offers us the features and options we felt were a must for the production of our live daily news programs" Cyr says. " Every audio source and setting we need to do our shows can be programmed and accessed on one surface. We can now do our news programs without having to go live into menus and layers to access the different sources. This allows us to react instantly to sometimes very complex and unpredictable situations” adds Roger Thériault, the main operator of the Vista 5 in Moncton. The number of available outputs on the Vista 5 was also an important deciding factor for Radio-Canada Acadie, as well as the console’s Vistonics™ operating interface, which provides instant overview as well as instant access to critical controls, thus making operation quick and safe. “The Vista 5 affords us the possibility of doing many ‘live’ remotes during the show with features such as interphone, mix/minuses and a listen function for the live reporters in the field,” says Thériault. “The Vistonics system makes the board very user-friendly and is much appreciated by everyone and anyone that operates the Vista 5." “Additionally, the mix/minus feature on the Vista 5 offers us new possibilities with our live remotes. For example, the host can now communicate off air with the reporter in the field, all this while the item is being aired live” adds Maurice Cyr.